Tewa Women United started in the mid-80s. Women from some of the Tewa-speaking and surrounding communities were gathering in a support circle and realized they were having some of the same challenging experiences. Eventually, they wanted to find a way to continue this ongoing support for others. TWU came from finding a way to answer the questions, “How do we continue to share our experiences with each other and others and continue our healing?” and “What can we do to support one another and others from our communities and families?” My aunt Evelyn and my aunt Josephine were part of that very early circle, and my mother Kathy joined about six months later; 1989 is when we officially say we were established or born. We were an all-volunteer organization until we got our 501(c)3 in 2001. In one of our earliest call outs to our communities, in the early 1990’s, about 150 Tewa women from the Española-Pojoaque valley gathered at the local college and had space to discuss, for the first time, the issues and experiences they faced. These conversations ranged from addiction issues to trying to maintain sobriety. There were some who had suffered the loss of loved ones to suicide, while others had lost family members to violence and natural causes. They were trying to get through the grief and loss process — involving things that women and our communities didn’t necessarily want to talk about. In fact, many were fearful to talk about them. From there, everything just blossomed to become what we are today. After high school, I went off to college and came back to this powerful group of women, whom I was not only related to and connected with, but also inspired by what they did. All of their heart work influenced my own process in this organization and helped me think about things like, what is racial justice? What is gender-based justice? What is feminism? How are we addressing various injustices in our community? How do we hold love? How do we hold compassion? It really helped me recognize that anger was a way to move through experiences – but not to dwell there. TWU was starting the sexual violence program at the time, and as a survivor of child sexual abuse, it was a healing process to experience the co-creation of a response to something I experienced so personally. This provided an opportunity not only for me, but for others to finally be able to talk and share. Our V.O.I.C.E.S. (Valuing Our Integrity with Courage, Empowerment and Support) sexual violence program started with realizing that most of our women were experiencing this, too. We developed a cultural response to sexual violence in Indian country and wanted to integrate healing modalities, those ancient healing practices that have long existed in Indigenous communities or land-based communities – China, Africa, India, the Americas, etc. – to help individuals and communities move through grief, release trauma, and reclaim their spirits. Since we started our program, we’ve been involved in establishing protocols on a federal level for child sexual abuse investigations. We’ve trained advocates across the country and helped to establish the Bureau of Indian Affairs’ Victim Advocacy Training Institute, where our tribal advocates who are serving victims/survivors will be trained. We are trying to get to this place where women are not just seen as body parts, but as the creators of life – because every person has to go through the body of a woman to get here. We, women, have been so disregarded as far as our power and our voice. There are high rates of violence committed against women and children in all communities, not just Native communities. We questioned, how come? So we began to ask, how do parents become parents? And what did they learn? This work really has influenced our development, and … our pivot to prevention. By asking these questions, we launched a participatory research project which helped us inform the development of our Yiya Vi Kagingdi Doula project, under our indigenous Women’s Health and Reproductive Justice program. We have most recently launched our own doula training institute. We held doula circles, midwives’ circles and a hospital practitioners’ circle to gather their input in the development of our training curricula. We have a strong network of reproductive justice programs, individuals and organizations working to protect that, here in the valley and across the state of New Mexico. We have been part of that wave since the beginning. We, along with the community, also helped establish the Birth of My Heart Birth Center here in Española. We have even started to support the training of abortion doulas to support women whose pregnancies are ending, by choice and not by choice. We know there are a lot of women around us who experience miscarriages for many different reasons: health; no access to care; economic barriers; and for us, critical environmental impacts. There are many misconceptions out there about abortion – but we know women do not make this choice without deep, conscious and intentional thought; sometimes, it is not even their intention to end a pregnancy but like I said, a miscarriage. Many don’t realize that women in that situation need to access those trained in the procedures used for abortion. But there has been no space for us to acknowledge or talk about this. We wanted to make space for that, so TWU supports and offers this. We are trying to get to this place where women are not just seen as body parts, but as the creators of life – because every person has to go through the body of a woman to get here. Our oldest foundational program is our Environmental Health and Environmental Justice program. We’re always fighting for public comment. We’ve been a voice for accountability to LANL (Los Alamos National Laboratory) and their work around worker rights, contamination of land, water, air and the necessary clean up because as women from Pueblo nations, we recognize our spiritual connection to place. We recognize that our communities are now confined by borders and barriers not of our own making. That the health of our ecosystems is what sustains us through generations and it is our responsibility to protect these for those yet to come. Anything negative that could happen to this land base is a direct threat to our ability to continue our culture for our children, and the health of our children. Under our EH/EJ program, we also support community gardens and seed sovereignty. We want to expose our young people to farming, because this valley has a rich history of farming and agriculture. We’re in a rural county – one of the poorest in New Mexico – so it is just amazing to see the transformation and coming together of community to support our Española Healing Food Oasis. It is transformative how people relate to space and the healing that comes from putting your hands and feet in the soil. It is an outdoor educational space where the community comes to learn about water reclamation and bioremediation. Here we are growing the traditional plants that have been used in healing all types of illness and traumas, helping to keep this information alive for our families and communities. Our next program area is our Women’s leadership and Economic Freedom Program which is actually an inter-generational leadership development. This program includes our A’Gin Healthy Sexuality and Body Sovereignty project and our Saayaa’In elder women’s wisdom circle – fitting into TWU’s vision to strengthen and re-strengthen families and communities to end violence against women, girls and Mother Earth. There’s this perception in society that there is an “issue” of teen pregnancy. What we understand of teen pregnancy is that it can stem from a number causes, one being a history of sexual violence. Funding was made available to Tribal communities to address teen pregnancy. We took this as an opportunity for us to address a number of factors that put teens at a disadvantage in decision making. For us, it wasn’t about ending teen pregnancy; it was looking at it as a whole and thinking, how do we educate our young people to make healthier choices and let them determine when and how they become parents? We know once you give people education and support, they make healthy choices to delay pregnancy and/or sexual activity – among other behaviors. They understand about protecting themselves against STDs, about risks, about having communication and consent. We did this by culturally adapting and enhancing a curriculum called Discovery Dating, developed by an Indigenous midwife, Alice Skenandore. We did this in partnership and consultation with community members and leaders, language teachers, elders, youth and service providers. This culturally adapted and enhanced curriculum is grounded in our Tewa language and values. We are committed to strengthening our young people’s ability to make healthier decisions about respecting themselves and others. We provide an opportunity for young people to participate as recipients of the curriculum – and a chance to develop skills for those who choose to become facilitators for their peers and now through our A’Gin Youth Leaders to be advocates for a variety of issues within their communities. In all of these programs that we have dedicated our heart work to, we have been questioned about serving the rest of the community – not just Tewa Women – because the work is so important. The answer to that is: WE DO. We’ve always been a multicultural, multiracial organization. Our sexual violence and doula programs are open to all in our community. Because of grant requirements, our healthy sexuality project right now is only for Native youth, but we’re looking at how to broaden that in the future. Our Saayaa’In is a multicultural, multiracial circle of elders. We’re really about loving, caring, and taking responsibility for ourselves and others. In our Tewa language, we’re using our Tewa values, but those are interpreted uniquely across all communities. We’re gender-inclusive in recognizing the LGBTQIA spectrum and continuum of identities and sexualities; however, we’ve been challenged because in reproductive justice and identity politics, our transgender siblings want us to be gender neutral; we push back because our experiences are not neutral in any way, shape or form. We’ve experienced what we’ve experienced as Native women because we’re Native women, and to erase that and put a gender-neutral frame on that is erasing our experiences again. It is a hard conversation, and, to me holds a lot of privilege. In other words: in this conservation you have the privilege of saying, “I’m going to be X” or “I’m not going to be this and that.” Whereas, as Native women, we’ve never had that privilege to say we’re not women; and the truth is, our violence is happening to us because we are women. In all of these programs that we have dedicated our heart work to, we have been questioned about serving the rest of the community – not just Tewa Women – because the work is so important. The answer to that is: WE DO. We’ve always been a multicultural, multiracial organization. We are keeping our name, because this is who we are. But we also are much more, and embrace all our families and communities. The violence against women has not stopped. In fact, it has heightened. We recognize this violence is also affecting our Trans and GNC siblings. In our solidarity with this shared struggle, we honor every individual to identify their gender as they feel fit, and this includes our identities as Native women. We believe in “and” – adding to, not taking away. Through all of our work, there’s always the question of how do you hold and provide services to people that are in trauma when you have experienced similar traumas? When you look at the historical, intergenerational, and individual complex traumas, it gives you a better understanding about what we may all be experiencing. Trauma and the healing of it have been a really big part of our spirituality. The ability to pray – to ask for guidance, to ask for support from things outside of ourselves – is a big part of our practice as TWU. We’ve been learning along the way, how to let go of those traumas and how to love again. The traumas affect you, so you can become really hard or really defensive and run away. Or you can learn to let go and face fears and move on to healing. TWU believes in healing – as we heal ourselves, we heal our ancestors – and simultaneously transform the future of our children. We must be committed to heart work and healing work. We will enter our 30th year in January, so we have been reflecting a lot. I really want to continue the impact that we have going forward. What we do is holistic and it’s with heart – the heart energy. I want the language, traditions, and the practices it comes from to continue to be that influencing energy. I’ve been really thinking about the fact that I’m 47 and I’ve been in this organization most of my life; there was a time where it was my identity. Some people still relate TWU to my mom and I, but it is so much more. A lot of women, men and young people have contributed to what it is today. I want people to also see everyone else in the organization. We have a dynamic staff of 17, many, many contractors and volunteers. They all hold knowledge, experience and expertise in the program areas TWU focuses on. We chose our site in Española because of the significance that it has for our community. This is a community where I want to see healing happening. I love and care about this community, and I'm hoping to make change and transformation here. Española has this reputation of being hard and full of drugs, but it has a lot of beauty and strength. There is so much beauty in this land; there are so many generations here. Tewa communities are all along the river valley, so this area was a place where they gathered to come together and strategize about different things. The future is really about embracing transformation through love. We have this idea that when you look to the past to bring it forward, you are looking back but not dwelling there and seeing what the energy is that we’re going to push forward — as long as it’s done with love, respect, compassion and listening to those most impacted. Tewa Women United has always been a social justice organization. That’s been in our mission statement since the very beginning. We try to reclaim a lot of our voice, our strength, our power, our traditions, our language, our practices in everything we do. We’re not just about providing direct services and Band-Aids. We strive to understand how dominance works, how oppression works, and understand what the tools are that allow us to survive and transform dominance and oppression. We are a collective of all of our experiences with multiple women, men and children. All of those experiences have guided our processes and directions, and that is where the power is. 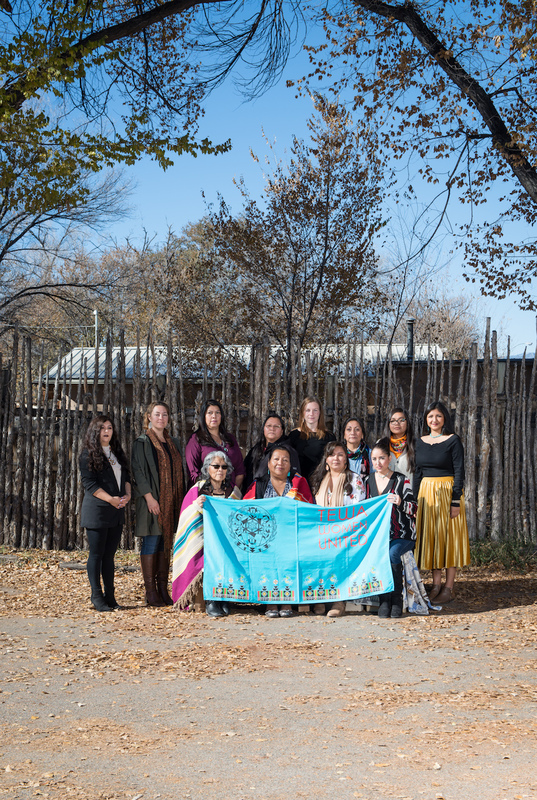 Located in the ancestral Tewa homelands of Northern New Mexico, Tewa Women United is a multicultural and multiracial organization founded and led by Native women. The name “Tewa Women United” comes from the Tewa words wi don gi mu which can be translated as “we are one” in mind, heart and in the spirit of love for all.